Oval brilliant cut diamond solitaire engagement rings, in a varied, range of individual designs, and setting styles, made to order, and available in many options to suit most budgets. An iconic modern classic oval diamond solitaire engagement ring with 4 claw Trellis styled setting. Personalise this oval ring with a wide range of diamond and precious metal options including Fairtrade Gold. Oval brilliant diamond, Four claw setting, Lucida style design. Flat ring profile, Available in 18ct White Gold, 18ct Yellow Gold, 950 Palladium and 950 Platinum. Wood boxed, gift packaged. Approx. 14 working days delivery. Uniquely styled 4 claw oval solitaire engagement ring featuring a flowing looped 4 claw setting and slim tapering shoulders. Unique 4 claw round diamond solitaire engagement ring with a stylised loop design for each rounded claw. Both shoulders flow into the unusual setting to hold your choice of oval brilliant cut diamond above elegant slender solid shoulders with a court profile shape. Please allow around 3-4 weeks for completion before shipping beautifully presented and gift packaged. 4 claw Oval brilliant cut diamond engagement ring with Wedfit setting and tapering court profile band. Unique design allows perfect fit for wedding ring. Open style allows light into stone, Solid tapering shoulders. Available in 18ct Yellow Gold, 18ct White Gold, 950 Platinum and 950 Palladium. Wood boxed. Gift packaged. Approx. 14 working days delivery. Sideways oriented east-west oval solitaire engagement ring, created with a tension style part bezel and open aspect with wedding ring friendly setting. Unique oval solitaire design allows perfect wedding ring fit. Styled for simplicity and visibility of the oval brilliant cut diamond. The ring design allows maximum light into stone. Styled with straight shoulders, the comfortable court profile band measures 2.5mm across and is wedding ring friendly. The Calais Oval solitaire diamond engagement ring is simple and feminine, elegantly framing a dazzling Oval diamond with an open four claw setting. 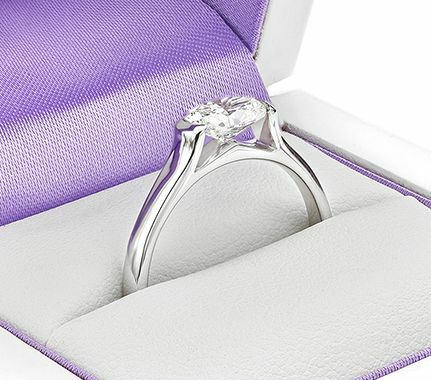 Benefitting from a wedding ring friendly design, the ring gracefully flows into a comfortable court shaped band. Four claws define the Calais Oval solitaire engagement ring. Styled with a wedding ring friendly setting, open tapering shoulders adjoin a court shaped comfort fit band approximately 2.2mm wide below the finger. Beautifully styled, the Serenity engagement ring makes a statement with simple styling combined with an elegant open setting to reveal a dazzling Oval brilliant cut diamond in a wedding ring friendly setting. Oval diamond, Sidways setting, Twist design, Cross-over shoulders, Tension style setting. Available in 18ct Yellow Gold, 18ct White Gold, 950 Platinum and 950 Palladium. Wood boxed. Gift packaged. Approx. 14 working days delivery. Choose your preferred diamond for this oval solitaire diamond engagement ring with a modern 4 claw setting with elegant comfort fit band. Modern 4 claw oval brilliant cut diamond ring design. Your selected oval diamond will be hand picked by the diamond carat weight, colour and clarity selected, with most options including full GIA or IGI diamond certification. Complimented with elegant claws around the diamond, the ring features beautiful tapering shoulders and arrives wood boxed and gift packaged within around 3-4 weeks. Each oval engagement ring is handcrafted in your chosen precious metal. We select the finest oval cut diamonds to complement your ring. From splendiferous solitaire designs to contemporary crafted oval settings. Our collection includes designs with a thin band, tapering band and wider band designs. Choose from Palladium, Platinum or White Gold. Purchase an oval engagement ring with or without a wedding ring, crafted to perfectly match your engagement ring. Each design is created over 4 weeks. Completed with a mirror polish, every ring is delivered packaged in a Serendipity Diamonds box, securely wrapped and hand delivered by insured courier.